Recycled plastic fencing is a practical solution to some of the drawbacks of traditional wooden fencing. While wooden fencing can be extremely attractive when first installed, many of these qualities don’t last for long. Fading, cracking, warping and rot are often the results over time. Many wooden fencing installations need maintenance after only two years, and complete replacement after seven. The fencing is made from recycled plastic lumber or plastic wood, and is considerably less expensive and more environmentally friendly than virgin plastic and is also less expensive solution than a traditional wood fencing product. The most durable scrap plastic used to manufacture plastic timber is most often either recycled High-density polyethylene (HDPE) or recycled polystyrene (PS). These recycled products are very durable and attractive and can be offered with several brightly colored alternatives. 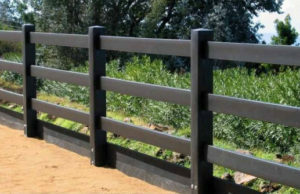 Recycled plastic fencing can look and feel like natural wood but is typically an improvement in design and quality to more conventional wood lumber and timber products. Unlike wood or vinyl fencing products, HDPE and PS plastic fencing will not warp, rot or generate mold and mildew and neither will they require periodic painting jobs or the need for potentially toxic germicides. Unlike vinyl or wood, HDPE and PS fencing will not shatter or split from the cold. The materials contains no heavy metals, arsenic, chloride or other contaminants of soil and ground water. Recycled plastic fencing is impermeable to acids in animal wastes and will not splinter nor cause injury. The unique thick-walled construction is found only in this type of plastic fencing, making it the sturdiest and safest of the plastic fences available today. HDPE and PS fencing is usually the best choice for your fencing needs. Relatively, inexpensive, environmentally friendly, strong and maintenance free, Recycled plastic fencing can keep its original beauty for decades to come.